On October 31, 1891, flames engulfed Clinton’s Main Street. With no fire department, the citizens fought the fire with buckets of water while the mayor telegraphed Flemington, Phillipsburg and Easton for help. Flemington responded with manpower but no apparatus. The Easton and Phillipsburg apparatus arrived two hours later and were able to extinguish the fire. However, 23 buildings were destroyed and the Clinton business district ceased to exist. Clinton would rebuild, but the fire presented a dilemma for Clinton and the surrounding communities---WHAT TO DO ABOUT FIRE PROTECTION? On December 27, 1897, the first meeting of The Annandale Hose Company No. 1 took place at the Hummer Brothers Carriage and Wagon Shop on West Street. Sixteen members were enrolled. They were Elmer Apgar, William Astle, Walter Boeman, John Carhart, Stacy Emmons, John Fulper, Manning Gand, John Hendershot, Walter Hoffman, Mansfield Hummer, Alvah Melick, Theodore Phillips, Thomas Seals, Isaac Smith, Theodore Starner and J. Haynes Wyckoff. Election of officers was held with Theodore Starner being elected the first chief and Stacy Emmons being elected the first president. The Annandale Hose Company’s first piece of equipment was a two-wheeled hose cart that had to be hauled by hand to the fires. The hose cart would be kept in the Hummer Brothers Carriage Shop. The members would be meeting at the carriage shop, but at times would meet across the street in the Larue & Fritts Insurance Agency building. This hose cart is still in the possession of The Company and resides in the new firehouse on Beaver Avenue. The first reported fire for the company occurred on July 3, 1898. The fire was in the attic of the Abner Allen home on Center Street. The fire was extinguished and all the contents of the house saved except for a set of theology books. The report stated that so much water was pumped into the house to put out the fire that one could have used a rowboat in the basement. At the June 15, 1900 meeting, it was reported that The Company’s records and papers had been stolen and burned. A $25.00 reward was offered for the arrest and conviction of the parties responsible. There is no record of the reward ever being paid or the guilty parties found. On September 6, 1901, the first set of bylaws for The Company were adopted and published. Then in February of 1902, the bylaws were amended to specify that the chief must conduct a drill at least once a month during April, May, June, July, August, September and October. In 1912, The Company began the process to purchase a lot and build a new firehouse. The lot chosen was owned by W.A. Larue/John P. Smith and was located behind what is now the old firehouse building on West and Roosevelt. The Company voted on August 5, 1912, to purchase the lot for $360.00. On August 13, 1912, The Company voted to have N.J. Wiggins build the new firehouse. Mr. William Savin donated the money to have the new firehouse built. The Company took possession of the new firehouse on November 29, 1912. Electricity wasn’t installed into the firehouse until August of 1920. In December of 1920, construction began on Roosevelt Avenue to connect Maple Avenue with West Street. A few months later on February 19, 1921, The Company voted to purchase the lot on the corner of West Street and Roosevelt Avenue from Joseph Congel for $158.00. The purpose was to move the firehouse to this location. The foundation was prepared and by May 10, 1921 the firehouse had been moved to this new location. In 1923, an electric siren was installed and in 1940 an addition to the firehouse was completed for a cost of $1,300.00. Between November, 1918 and January, 1919, one of the most unusual incidents in Company history occurred when The Company brought charges against George Von Billand for driving an automobile over hose during a drill. Mr. Von Billand was later excused from the charge for lack of evidence, but was required to pay court costs. In August of 1924, a motion was passed to begin looking into the purchase of a motorized fire truck. A committee was set up to investigate and report back. On February 14, 1925, the committee presented its report and recommendations. The report was approved and The Company voted to have the committee proceed. The truck to be purchased was a 1925 Model T Ford and the total cost of the truck with all the extra additions was $1,195.34. Through contributions and fund raising, The Company was able to raise $1,198.73. The funds collected exceeded expenses by $3.39. This truck would remain in use until 1945 when it was replaced. The truck was sold in 1956 to William Meduno of Ridgewood, New Jersey for $550.00. Very little was known about the truck after that until 2011 when Gordon Olsen, former chief of The Annandale Hose Company, located it in a Model T Museum in Indiana. During World War II, the firehouse was used by the local chapter of The Red Cross and the local rationing board. The Fire Company participated in numerous air raid drills during the war, but never had to put to use what they learned in an actual air raid. Remembering their brother firemen, in the years of November 1942, 1943 and 1944, the Company sent checks of $2.50 to those members on active duty in the military as Christmas gifts. After the war, The Company members serving overseas began returning home and life started to return to somewhat “normal”. The first item on The Company’s postwar agenda was to secure a new fire truck. The Company entered into negotiations with The Township Committee for the purchase of the new truck. As a result of the negotiations, The Township Committee agreed to purchase the new truck, a 1945 Mack fire truck. In return, The Company had to purchase the equipment for the new truck and accept an increase in the area they would cover in the township. 1947 marked the 50th anniversary of The Annandale Hose Company. The Company celebrated the event with a dinner at the Lanark Hotel in Belvidere, New Jersey. Honored at the dinner was J. Haynes Wyckoff, one of the original members of The Company. Another notable event in 1947 was the formation of the ladies auxiliary. The attendees at this first meeting were Mrs. Wilmer Burns, Mrs. Charles Deckhut, Mrs. Lerdy Eick, Mrs. Ormond Eick, Mrs. John Hall, Mrs. Frank Molnar, Mrs. George Trimmer, Mrs. William Whitely and Mrs. J. Haynes Wyckoff. The Ladies Auxiliary has continued to be a vital part of The Company since that first meeting. Thanks to years of efforts by Patricia Schutts (and hubby Bill), fund raising activities such as soup sales, Chinese actions, and bus trips enabled the Auxiliary to provide much needed behind the scenes support. Continuing the tradition today, Auxiliary president Tara Lunger and the ladies assist in the Halloween “Safe Night Out”, host the annual family Christmas party and present an annual gift to the firefighters. In 1953, The Company put into service its first tanker truck, a 1947 Dodge carrying a 700 gallon tank. In 1958, The Township Committee approved the purchase of a new International pumper. The new 1959 International pumper was delivered to The Company in June of 1959 and wet down for the new truck was held on July 11, 1959. The Company would add additional apparatus with a 1971 International pumper and another tanker to replace the 1947 Dodge. In early 1960, The Company was informed that a new headquarters for them was being constructed in the township municipal building at the corner of West Street and Washington Avenue. As a result, on October 12, 1961, The Company approved a motion to sell the firehouse on the corner of West Street and Roosevelt Avenue. In November, the public was notified of the sale and invited to bid on the property. On November 27, 1961, a special meeting was held to take action on the bids. The highest bid was submitted by Edgar Philhower for $3,100.00. His bid was accepted and the deed and proper papers were ordered drawn up. The Company had been moving into its new headquarters since the summer and the move was completed by the end of December that year. On March 25, 1963, The Company voted to approach Nelson Ramsey, the Hunterdon County Fire Marshal, about eligibility and representation in The Fire Chief’s Association. The Company was notified of approval for membership and on April 29, 1963 The Company voted to pay the membership dues for 6 line officers. The 1970’s was a very important and active decade for The Annandale Hose Company. The Company’s Junior Fireman’s Program was finally approved by The Township Committee. It had taken the entire decade to get that approval and on May 31, 1979 the first meeting for the junior firemen was held. There were six members of the original group: Michael Caskey, Robert Emery, Bruce Faust, William Faust, III, John Harris, Jr. and David Schutts. All went on to become active members of The Company, with William Faust III and Robert Emery each serving as chief of The Company. Bruce Faust later became a professional firefighter in Washington, DC and retired as a Deputy Chief. The Junior Fireman Program continues to be an integral part of The Company, providing opportunities for young people to learn and train for possible membership or receive credit for community service. On November 21, 1971, The Company learned that the Clinton Township Committee had passed an ordinance giving The Annandale Hose Company responsibility for fire protection for the entire Township. As a result, The Company began an effort to have a second station built in the southern part of the township. Finally, The Township Committee approved the establishment of a second fire station on March 26, 1979. This station was built on Route 31 South, near Payne Road and was dedicated on Sunday, December 13, 1981. 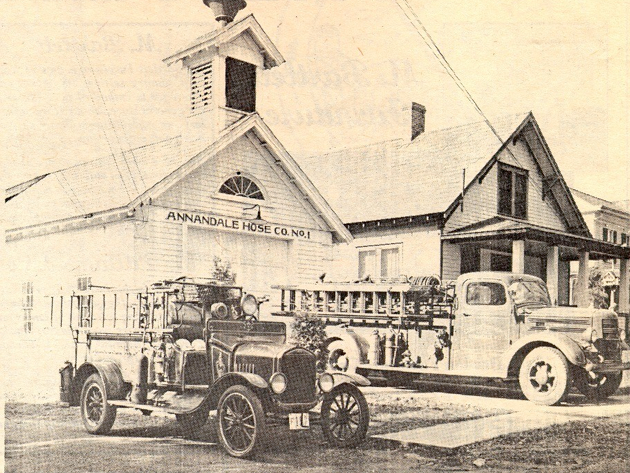 Until 1973, all members of The Annandale Hose Company had to live within The Village of Annandale. In April, 1973, The Company approved Richard Pill, the first member from outside The Village of Annandale, for active membership. Today, the majority of The Company members reside outside of The village. The early 1970’s saw the addition of two additional pieces of apparatus to help protect the Township. They were a new 1971 International pumper and a Dodge Power Wagon brush truck purchased from the Basking Ridge Fire Company. There were several notable fires and incidents in the 1970’s. On March 7, 1973, The Company responded to a call at The Mountainview Correctional Facility where they assisted at an inmate disturbance. For this assistance, The Company received a letter of thanks from Governor William T. Cahill. This letter is prominently displayed at the firehouse on Beaver Avenue. In February of 1975, The Company responded to a major structure fire at the Goble farm (now the Exxon property). This fire resulted in the loss of the barn, tenant house and other outbuildings. One of the most heart-wrenching calls was responding to a tree house fire in Deer Meadow. The fire was extinguished but a young male had died and the members had to search for and recover the body. An incident which was not easily dealt with, nor forgotten. Other notable calls included fires at The Martin Funeral Home and The Stanton Grange. The 1980’s saw the complete opening of Route 78 from New York City to the Pennsylvania border. This significantly increased the number of calls that The Company had to respond to. During this time, Exxon and a number of other companies moved into the Township and opened multi-story buildings. The Company realized they needed a truck that could provide access to the upper floors of these buildings. In September of 1982, The Company voted to purchase a Mack aerial scope from The New York City Fire Department. Other vehicles added during this time were a new Mack pumper and brush truck. In June of 1993, three members of The Company, Tom Zakszewski, Scott Hockenbury and Roy Smith, were honored for rescuing drivers trapped in their vehicles in hazardous conditions. In May of 1995, The Company began discussions with The Township Committee about building a new firehouse with a proposed location being the Austin tract on Beaver Avenue. In March of 1997 the Township began budgeting money for this new firehouse. The groundbreaking for the new firehouse took place on December 30, 1999.The building was built and on December 31, 2002 the dedication ceremony for the new firehouse was held. The year 1997 marked the 100th anniversary of The Annandale Hose Company. Planning began to celebrate this momentous occasion. The date of May 17, 1997 was chosen for the anniversary celebration. On that day, the festivities included a remembrance and dedication ceremony, carnival rides for the children, money wheel, and in the evening a block party with live music. Kids were given limousine rides around town. The firefighters from South Amboy, NJ constructed a 40 foot barbecue pit to cook their famous ribs. For a price of $10.00, patrons received a plastic beer mug along with a serving of ribs & roast beef. Music was provided by the fabulous Rockets nightclub band. They performed on the mobile county stage parked on West St. The village of Annandale had never seen a block party like this. It was truly a memorable day for The Annandale Hose Company. After the celebration, The Company began its second century of service to the residents of Clinton Township. Between 1998 and 2000, there was discussion of a merger of the Lebanon Fire Company with Clinton Township division of Fire. Although there was continuous discussion of the matter, the merger did not take place. On May 22, 2002, 14 members of The Company were honored for their actions during an incident that occurred on Route 22 on April 20, 2001. Those members honored were Timothy Brosnan, Anthony Semenza, Steven Young, Brian Dettra, Matthew Guindon, Andrew McAleer, Frederick Schutts, Roy Smith, Michael Stevens, David Lunger, Christopher Young, Shawn Herman, Martin Peverley and Robert Emery. On December 11, 2005, four members of The Company were honored for their actions at a multi-vehicle accident on Route 78 in May of 2005. Those honored were Frederick Schutts, Andrew McAleer, David Lunger and Shawn Herman. In October of 2011, New Jersey was hit by the Halloween Irene nor’easter. Then, one year later, on October 29, 2012, Hurricane Sandy came ashore and wreaked havoc on the state. These storms presented many challenges, especially downed trees and electrical wires to emergency services across the state. Working hours on end during the worst of the storm, firefighter crews were continually dispatched throughout the township. One crew, unable to free their engine which became stuck on a muddy property, had to be rescued by brother firefighters cutting through toppled trees while avoiding downed powerlines. The Annandale Hose Company along with other emergency services worked diligently to assist in the cleanup during the aftermath of these two devastating storms. In the months following the September 11, 2001 attacks, The Annandale Hose Company helped raise money for the families of those members of the FDNY and NYPD who were victims of the attack. On Sunday, September 9, 2012, The Annandale Hose Company held a ceremony to dedicate its 9-11 Memorial and Uniformed Services Memorials. The 9-11 Memorial consists of a piece of steel and marble tiles from Ground Zero. The Uniformed Services Memorials are dedicated to the five branches of The Armed Forces. This ceremony honored those lost on September 11, 2001 in the terrorist attacks on The World Trade Center, Manhattan, New York, those who have served and those who are presently serving in our military. The Company wishes to thank their brother members past & present for their insight, record keeping and assistance in compiling our first historical publication. As the tradition and history of the Annandale Hose Company #1 continues, it is hoped that those members to follow will demonstrate an ongoing effort to document and publish activities and notable events. Special thanks to Charles “Chip” Riddle for countless research hours and investigations spent in compiling this history.